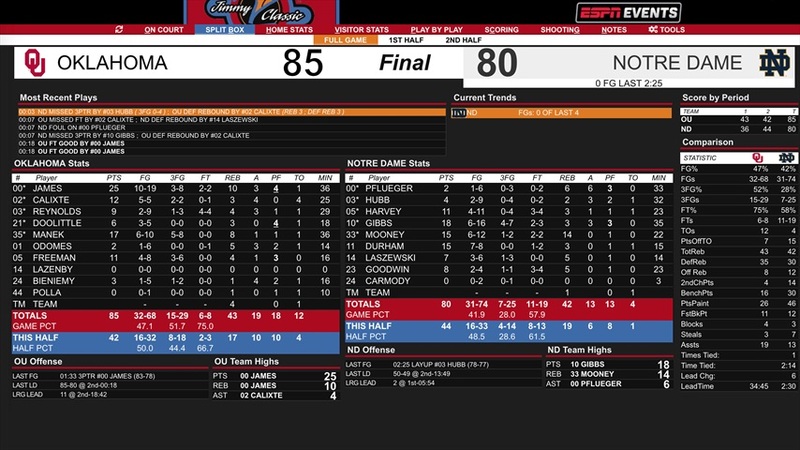 Notre Dame (6-2) was unable to come up with clutch buckets in crunch time and was defeated 85-80 by Oklahoma (7-1) in its first road test of the season. With 32 seconds left in the game, Rex Pflueger was fouled on a drive to the hoop by Christian James and wasn’t able to cash in from the free throw line. The Irish were down 83-80. 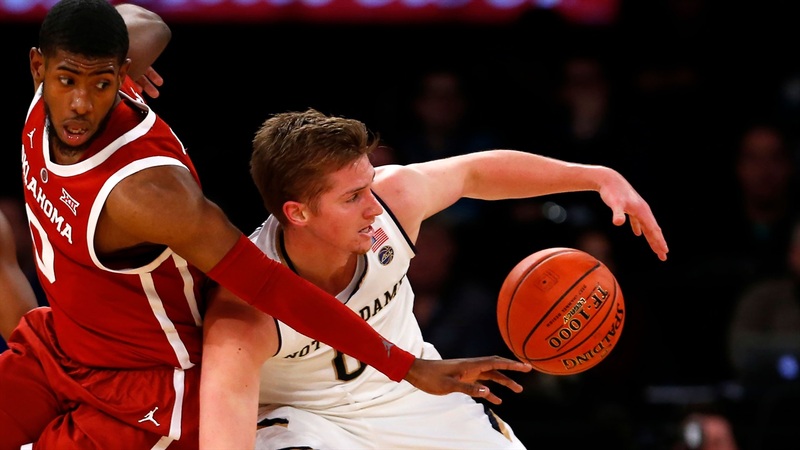 The Sooners inbounded the ball, and TJ Gibbs fouled James forcing an inbound pass. Brady Manek couldn’t get the ball in, and a five-second call was called. Unfortunately, moments later Gibbs put up a contested layup that didn’t go. James iced the game with two free throws. James hit two clutch buckets down the stretch including a three-pointer with 1:18 left in the game to give his team a five-point lead, 83-78. “Credit to Oklahoma,” stated Notre Dame head coach Mike Brey. “They were shooting the heck out of it tonight. I know they had shooters, but they really shot it well. I’m proud of our group with all the new faces. First road game on this stage and throwing some young guys in there. I tohught we battled and gave ourselves a chance. Oklahoma opened the second half on a 4-0 run, but Notre Dame went on a 14-2 run to take a 50-49 lead after a Durham layup. This was countered by a 6-0 run by the Sooners sparked by a 3-pointer by Miles Reynolds. The rest of the second half was all Oklahoma due to hot three-point shooting led by Matt Freeman, Manek and James. The Irish stayed close with the play of Juwan Durham and Gibbs. 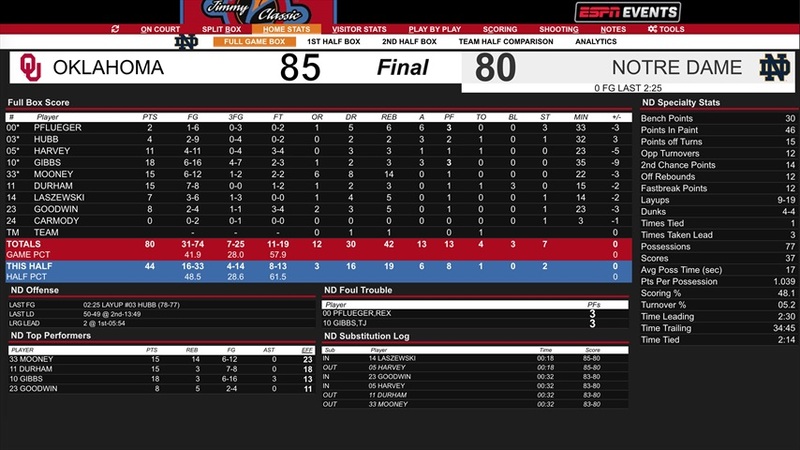 Notre Dame ended the game shooting 42 percent from the field and just 28 percent from the three-point line. They played clean basketball and only turned the ball over four times and forced 12 Oklahoma turnovers. John Mooney ended the game with 15 points and 14 rebounds and was huge in the first half, but senior captain Gibbs and Durham paced the Irish in the second. Gibbs scored 15 of his 18 points in the second half and Durham scored nine of his 15 points in the second half. James scored 16 of his game-high 25 points in the second half. He also added 10 rebounds. Manek added 17 points, and the big story was Freeman’s 11 second half points which included three from long range. Freeman came into the game averaging three points a game. After controlling most of the first half after a quick shooting start for the Sooners about halfway through the opening half, the Irish began to find a rhythm. Down 26-21, senior guard Pflueger forced a steal on the defensive end and laid it in on the offensive end. This started a quick 6-0 run to give Notre Dame their first lead of the game, 27-26 with 7:51 left in the first half. Notre Dame’s defense forcing turnovers and Mooney’s aggression on the offensive glass kept them close after Oklahoma’s hot start. The game went back and forth for the rest of the first half, but the Sooners were able to pull away a little bit when Kristian Doolittle hit a contested layup to give his team a 35-32 lead. This led to a quick 7-0 run in under a minute to extend the lead to 40-32. After a 30-second timeout Notre Dame was able to end that run with a Chase Goodwin layup to pull within six. However, this was countered by a three-pointer by Manek. It was his third of the half. Mooney secured a first-half double-double with two free throws late to pull the Irish within seven at halftime, 43-36. Notre Dame shot just 37 percent from the first in the first half, but were able to score 10 points off the eight turnovers they were able to force. They also nabbed eight offensive rebounds which led to nine second-chance points. Mooney led the way with 11 points and 11 rebounds to keep the Irish within reach. Oklahoma shot 43 percent from the field in the first half and an outstanding 67 percent from three points range. (7-for-11) Manek led the way with 11 points and seven rebounds and James and Aaron Calixte added nine and eight points respectively. “We scored in the second half,” said Brey. “We have been searching offensively. For us to put 80 on the board, I’m looking for some silver linings. We scored 44 in the second half and got into a good rhythm. We were throwing it into the post. You’re seeing it as I’m seeing it. It’s coming.